ბილ ევანსი (ინგლ. William John Evans; დ. 16 აგვისტო, 1929, ნიუ-ჯერსი, აშშ — გ. 15 სექტემბერი, 1980, ნიუ-იორკი, აშშ) — ამერიკელი ჯაზის პიანისტი და კომპოზიტორი. ევანსს ეკუთვნის გრემის 7 ჯილდო და 31 ნომინაცია, მათ შორის Grammy Lifetime Achievement Award - განსაკუთრებული წვლისთვის ჯაზში. წარმატების მიუხედავად ის იტანჯებოდა ნარკოტიკებისგან. ევანსი დიდი ხნის განმავლობაში მოიხმარდა ჯერ ჰეროინს, ხოლო შემდეგ კოკაინს, რაც მისი მუსიკალურ, ფინანსურ და შემოქმედებით მდგომარეობაზეც აისახა ნეგატიურად. ↑ O'Neil, Thomas (1993). The Grammys: For the Record (Paperback ed.). Penguin Books. ISBN 978-0-14-016657-6. ↑ Pettinger, Peter (2002) . Bill Evans: How My Heart Sings (New Ed ed.). Yale University Press. ISBN 0-300-09727-1. ↑ Verchomin, Laurie (2010). 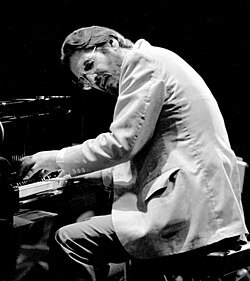 The Big Love, Life and Death with Bill Evans. ISBN 978-1-4565-6309-7.
ეს გვერდი ბოლოს დარედაქტირდა: 13:31, 20 აგვისტო 2018.